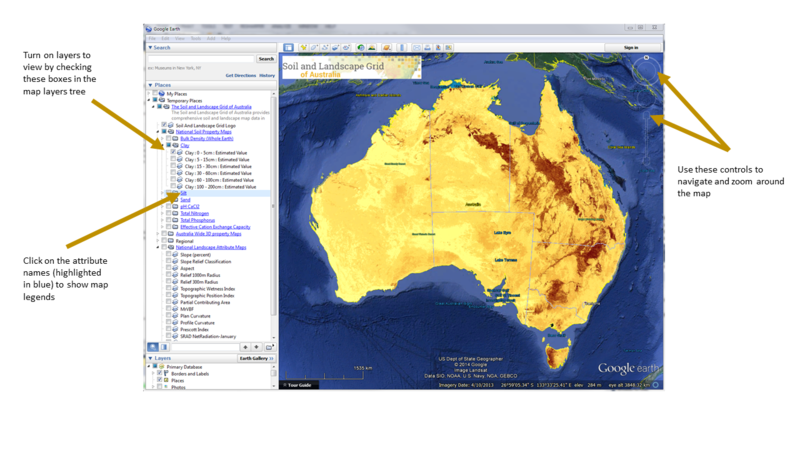 The Soil and Landscape Grid of Australia map products can be viewed in Google Earth by downloading this KML file [0.5Mb]. Important - to use this KML file you need to have Google Earth installed on your computer. The Google Earth software is available as a free download from Google. The images are drawn on the fly from the data store, so may take a few seconds to render. Zoom to your area of interest and wait a few seconds for the map to refresh. The map will be greyed out while it is waiting to refresh.